Having a clean house is a great feeling. Customers tell us all the time how refreshing it is to come home to a clean house. It’s a very important task, but few people have time to thoroughly do the cleaning themselves. That is why Above and Beyond Residential Cleaning Services exists: to provide our customers with a clean home so that they need to set aside family, play or work time to have that clean home. We come clean your home on a regular basis so you know your home is getting the proper cleaning attention it deserves. With so much going on in your daily life, don’t let cleaning become a tiresome chore that takes away from coveted free time. With our house cleaning services, you’ll never have to worry about a dirty home, and you’ll have more time to spend catching up with friends or relaxing with your family. Let Above and Beyond elevate your home’s cleanliness. With any cleaning company that comes into your home, you want to know you can trust the people who have access to your belongings. When you work with Above and Beyond’s recurring maid services, you can rest easy knowing that the same team will come to your house each visit. 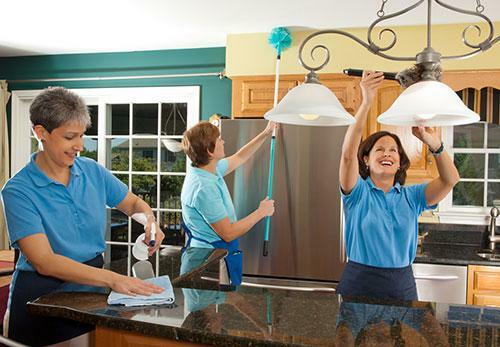 Seeing the same friendly faces every week will ensure your house gets thoroughly cleaned every time. Our maids work to build a trusting relationship with our clients. You can also trust that our maids will come prepared every visit, bringing all supplies and cleaning equipment needed to restore order on your property. Whether this is your first time hiring a regular cleaning service or you’ve had a bad experience with another company in the past, Above and Beyond guarantees nothing short of satisfaction in our recurring maid services. If you’re looking for recurring cleaning services to help manage your home cleaning contact Above and Beyond to get a quote. We quote right over the phone or by email, so there’s no need to take time out of your busy schedule.